Tyson Fury was denied a memorable victory in Los Angeles after his fight with Deontay Wilder ended in a draw in. Fury appeared to have dominated the fight, and victory for Fury would have been a truly staggering achievement in what was his first meaningful bout since returning to the ring from a two-and-half-year absence. 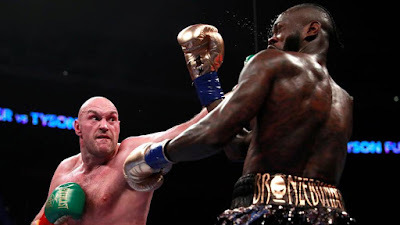 Fury, who came into the fight 44lbs heavier, was expected to find the going tough against the hard-hitting Wilder, but the Manchester boxer came out on top in LA for most of the fight. Fury stunned Wilder by getting back to his feet twice, with the second coming in an explosive twelfth and final round. Fury looked like he was dead and buried when he was flawed by Wilder, but again he got up - and the American could not believe what he had seen. Seemingly dazed by the pure grit and will he was up against, it was Wilder who was on the ropes in the final seconds, as Fury unleashed the punches to win and cap a stunning comeback. But with the twelve rounds compete, it went to the judges’ scoring, and it was deemed a split decision.